Make Spring birthdays, Easter, or Mother's Day extra special with this beautiful floral gift box of amazing premium candies. 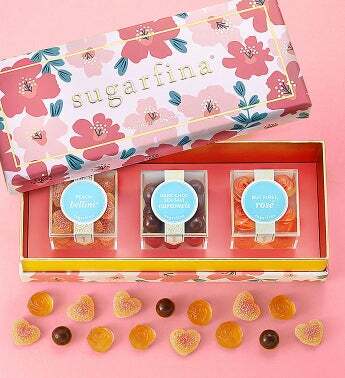 Includes three adorable lucite boxes of Sugarfina's most popular sweets: But First, Rosé Roses, Dark Chocolate Sea Salt Caramels, and Peach Bellini® Gummies. Sugarfina, founded by a couple who love candy and each other, was named one of the world's 50 most innovative companies in 2018 by Fast Company. Celebrate deliciously! Dark Chocolate Sea Salt Caramels - It doesn't get much better than this... Rich & creamy caramels are dipped in ultra-fine dark chocolate, with just a kiss of sea salt. With premium all-natural ingredients, this is the ultimate indulgence for caramel lovers. Peach Bellini® - Peach with a pucker... These all-natural gummies are filled with a juicy peach center, then dusted in sweet & sour sugar crystals for a mouthwatering taste sensation. They'll be totally smitten with these unique peachy hearts.